The Village of Winfield is an undiscovered gem. People move here because of the variety of homes, the Metra train station, the mature trees, the natural beauty, the larger lots, the low taxes, the Public Library, the proximity of shopping, and the good local schools. But most of all, people come here by accident. People frequently discover Winfield by accident. They take a turn off Roosevelt Road or Geneva and here they are, and right away they can tell Winfield is a pretty nice place to live. Our goal with Positive On Winfield is to turn Winfield from an accidental discovery into a desired destination; not the kind of place that draws the crowds; but attracts people who are looking for an Outdoor Healthy Living Community, a great place to raise a family, to appreciate nature, to enjoy neighbors, to build friendships. While there are many great communities in our area, we feel that a rare combination of desirable features make our Village unique. Winfield has five DuPage County forest preserves on its boundaries, more public woodland than any other community in the county. There are places to enjoy running, hiking, and horseback riding. There is a canoe launch into the West Branch DuPage River. If you prefer flat water canoeing, Silver Lake in Blackwell Forest Preserve is just down the road. There are several off-leash dog parks nearby, even an “indoor” dog park close to town center. Winfield is a bike rider’s paradise, featuring direct access to the Illinois Prairie Path and home to the annual Criterium Bike Race. We actually have hills to challenge runners and riders. Fly a private plane? DuPage Airport is only 15 minutes away. We have fine catch-and-release bass fishing, but you’ll have to locate the good spots on your own. There are several thriving churches nearby and in the middle of town is Central DuPage Hospital, a growing and respected medical facility. When you add it up, Winfield offers much to residents and visitors. Choosing a community is a commitment. The biggest single investment most of us make is in our homes. 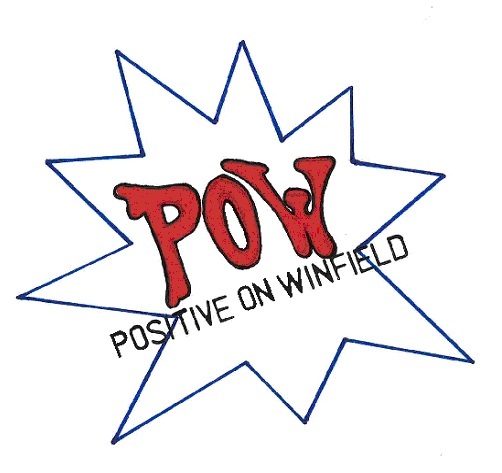 Positive On Winfield seeks to preserve and enhance what is good and unique about Winfield – and get the word out to those looking to enjoy what we have. Last year, in 2010, Winfield ranked among the Top-10 communities in the entire Chicagoland area in terms of new home construction. That’s because Winfield is a great place to be. The equity in our homes is not strictly represented by the number of monthly payments we have made, or the money we have spent to keep up with repairs or make improvements. But, our equity is also represented in the value of our neighborhoods and in the Village. All of us, at some point, will put our houses up for sale. When we do, we want to realize maximum value for our homes, maximum benefit to the Village with a minimum time on the market. A healthy, well-run, desirable community will be a pleasure to enjoy while we are here and an aid to marketing when it is time to sell our homes. We can achieve this when we all get Positive On Winfield!